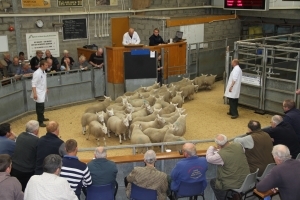 Caithness Livestock Centre, built on the Quoybrae farm in 1992, is a modern auction mart ideally situated in the centre of Caithness and convenient for both local consignors and buyers from the south. The centre, which has a reputation for showing high quality livestock, offers a complete livestock marketing service for Caithness farmers, with a series of seasonal sales for Store and Breeding Stock. It provides a 'shop window' for quality Caithness beef cattle and sheep, consistently attracting buyers from across Scotland. The centre also offers weekly collections of Cull Cows and Bulls, Prime Sheep and Cast Ewes destined for Thainstone Centre. Out of season collections are also available for Store Cattle and Sheep. Caithness Livestock Centre also offers a range of direct marketing services for prime cattle and sheep to abattoirs throughout the country. Store lambs are also sold at ANM’s Quoybrae Mart in Caithness with the emphasis on the autumn months. The sales schedule starts with a hill lamb sale in the second week in August followed a week later by a sale of half-bred ewe and wedder lambs including a show. Following that, store lambs are sold every second Monday during the season. The September sale of North Country Cheviot lambs attracts an entry of around 6,000 heads. Outwith these hours the office telephone (01955 621363) will be answered on divert. Alternatively call any of our Caithness team.